Cameroon international forward Samuel Eto'o scored twice in Barcelona's thoroughly convincing 6-0 victory over Malaga on Sunday evening, and his double strike made him a member of a very elite band of forwards. 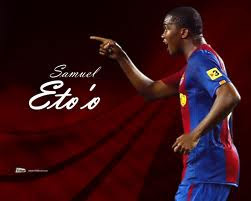 Eto'o's clinical finishes moved him onto 123 goals for the Blaugrana in official competitions, making him the fifth top goalscorer in the club's glittering history and moving him just one effort behind Mariano Martin in the all-time rankings. Eto'o moved to Barcelona in 2004 after a hugely successful spell at Real Mallorca, and has since established himself as one of Europe's most prolific strikers in the five seasons since. It appeared he may have been surplus to requirements at the Camp Nou after Pep Guardiola's re-building began in the summer, but he has proven that he's as important to the Catalan giants as ever, scoring 23 goals in 24 Primera Division matches, putting him in pole position to claim the Pichichi top goalscorer award. Eto'o's goals edged him ahead of Dutchman Patrick Kluivert in the all-time goalscoring chart, however, he still has a long way to go to catch up with Barcelona's two most famous hit-men. In position number one is Cesar, who has scored 235 goals in official matches for the club and he sits ahead of Hungarian Ladislao Kubala who achieved 196 strikes in the 1950's. Brazilian forward Rivaldo completes the top three, with his 130 strikes during his six year spell at the club.